Hotel Kralj is situated around 100 km from Croatia's capital - Zagreb in Međimurje, only 2 km from the outskirts of town Prelog and has opened it's doors in the middle of 2008 to our guests as a part of a Tehnix ltd. company. Surrounded by green nature, situated by the creek of Bistrec it offers a unique delight of nature and gives the guest special feeling of lower part of Međimurje, which is well known as the most beautifull Crotian flower garden. Our business hotel offers top content, it is pleasant for vacation and recreation of managers and other guests. It offers a lot more than vacation: organization of congresses, tribunes, presentations, seminars, team buildings offering top quality services and accommodation. Rich gastronomical experience of authentic cousines, using only ecological and natural food resources, pleasant internal and external ambient and possibility of sport or recreation will fulfill all your expectations. Friendly and helpful staff is offering services with a smile and our great chef will provide you with an ultimate gastronomical experience in our restaurant. We also often reward our non-smoking customers, families or organized groups. Sports and recreation are a foundation of health lifestyle of every modern man or woman, just as managers. 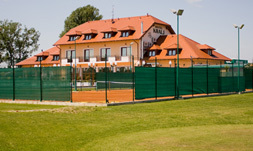 Hotel Kralj can offer recreation on tennis court or golf practice court and refreshment in our outdoor pool during the summer time. External walkingpath long 1km and trekking path of total length od 3 km by the creek are great way to explore local nature. We also have a bike rental service. Another great way to explore local nature is by organized hunting and fishing activities in natural habitats.